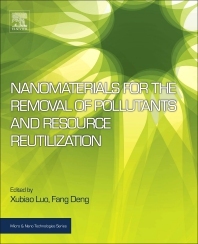 Nanomaterials for the Removal of Pollutants and Resource Reutilization presents the fundamental principles necessary for the application of nanomaterials in environmental pollution control and resource reutilization, also describing specific novel applications of environmentally functional nanomaterials. In addition to outlining the applications of nanomaterials for pollution control, the book highlights problems and offers solutions. This comprehensive resource will inspire the next generation of nanomaterial designers, providing a state-of-the-art review and exploration of emerging developments. Xubiao Luo received his BS and MS in Hunan Normal University; his PhD in 2006 from Hunan University. In 2011, he became a Professor in Nanchang Hangkong University. His current research interests include environmental biotechnology and bioremediation, nano-materials and environmental functional materials for deeply treating wastewater and recycling resources, photocatalysis, and environmental monitoring method. Fang Deng received her PhD in Industrial Catalysis in 2011 from Nanchang University. In 2013, she became an Associate Professor at Nanchang Hangkong University. Her current research interests include nano-materials and environmental functional materials for deeply treating wastewater and recycling resources, photocatalysis, environmental monitoring method.